I read Patty of Elm Street Quilts blog and every month I think “I am going to participate in her One Monthly Goal challenge”. And every month I say “maybe next month”. Well, Enough! this month I am going to join in the fun. Of course I pick the month to start that I’m doing mostly secret sewing that I can’t share with anyone until the middle of July. 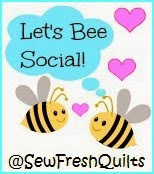 I have dresses I need to sew, a secret project that I can’t talk about, and 50 zipper pouches to give as gifts. There! those I can talk about and even show some pictures, there’s my OMG! for the month of June. I am going to be on work travel for a week in the middle of this month, I think I am going to pack my sewing machine with me and do some sewing in my hotel room at night and the zipper bags are the ideal project to take with me. I volunteer with a girls organization and we are having our annual state convention in the middle of July. I like to make a zipper pouch for a group of girls that I work with, I’ve done this for the past few years and every year I tell myself that I should be making them during the winter when it’s a bit quieter, but every year it’s June and I’m sewing like a crazy woman trying to get everything done. Since I haven’t even picked out my fabric for those, I will show some pictures of some of the secret project, but not enough to give it away. I will share this project once I can, later in July. I love a rainbow. In the meantime, check out what everyone else is posting as their One Monthly Goal. Wow, can’t believe you’re going to pack up your sewing machine. But the n it’s a brilliant idea to sew in a hotel where there is no distractions at night. Good luck to you. Love the rainbow! So glad you decided to join in! 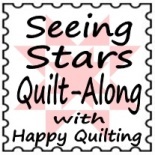 Thanks for linking up with Elm Street Quilts One Monthly Goal and good luck on your project!